The U.S. 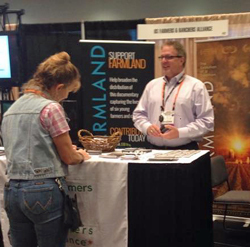 Farmers and Ranchers Alliance (USFRA) had a booth at the 2015 Cattle Industry Convention’s big trade show in San Antonio last week where CEO Randy Krotz was able to meet with producers and tell them about what the alliance has been doing to help increase communications with consumers. Krotz was able to tell cattle producers about the recent launch of the How To Farm video series and how it is has been received, the recent Food Dialogues: Dairy Forum that discussed current issues such as animal welfare, and the I am Farmland initiative building off the documentary into educational programs.